Mauritius is preparing to host one of the main events of the African sports calendar this year: the 10th edition of the Indian Ocean Island Games. The organizing committee met on Wednesday 10th April which also marked the 100 days-countdown to the IOSG which will be held from the 19th to 28th of July 2019. We are 98 days away from the Indian Ocean Island Games! And on Wednesday, the organizing committee of the IOSG held a major event at the Caudan Arts Centre, Port Louis, to mark to beginning of the countdown. The Minister of Youth and Sports, Mr Stephan Toussaint, said he expects convincing results from the athletes, while relying on the support of all the Mauritians for this grand event. “This is the first time that the various federations have received a budget to prepare their athletes two years before the Games. I’m expecting results, a maximum of gold medals. It is after 16 years that we welcome the 10th Games, so it must be memorable,”said the Minister. The Vice President of the organizing committee, Mr Mubarak Boodhun, gave assurance that the multi-sports arena of Côte d’Or will be ready in time. He pointed out that the work has reached a very advanced stage. The works for the infrastructure that will be used for the Games is set to finish by the end of June and to be delivered on the 30th of the said month. “I noticed during a visit to the site last week, that the work is going well. There are about a thousand people working in the field. Many will be surprised by the quality of the infrastructure,” says the Permanent Secretary of the Ministry of Youth and Sports. Otherwise, Mr Prashant Ujoodha, head of the development and infrastructure department, explained that work is progressing on the 17 sites (15 in Mauritius and 2 in Rodrigues) currently under renovation. “Work at Germain Commarmond in Bambous and New George V in Curepipe will be completed by May. The Anjalay stadium in Belle-Vue will be delivered in June. On the other sites, more than 60% of the works have already been done,” he says. Regarding the site where the rugby competition will take place, the organizing committee will a better idea as to where the matches will take place this Friday 12th April. The choice should be between Northfields and Gymkhana at Vacoas. Moreover, according to Mr Rajen Descann, head of the technical and sports commission, the competition’s fixtures are about to be finalized. “There are a total of 227 events, so 227 gold medals are at stakes. The competition of the fixtures is about to be finalized. For the last two years, we have been working with the concerned federations to ensure that everything is ready in time,” he said. To mark the countdown, the Organizing Committee of the Islands of the Indian Ocean (COJI) has organized a colourful show on Wednesday at the Port Louis Waterfront. A spectacular arrival of Krouink, an unprecedented show, as well as fireworks, marked this great sports gathering. The Minister of Youth and Sports, Stephan Toussaint, the Permanent Secretary, Mubarak Boodhun, the Mayor of Port Louis, Daniel Laurent, as well as the CEO of the Organizing Committee of the Indian Ocean Islands Games, Jean-Pierre Sauzier, were among the personalities present. However, Krouink has once again stolen the show by making a very noticed arrival on a motorcycle. 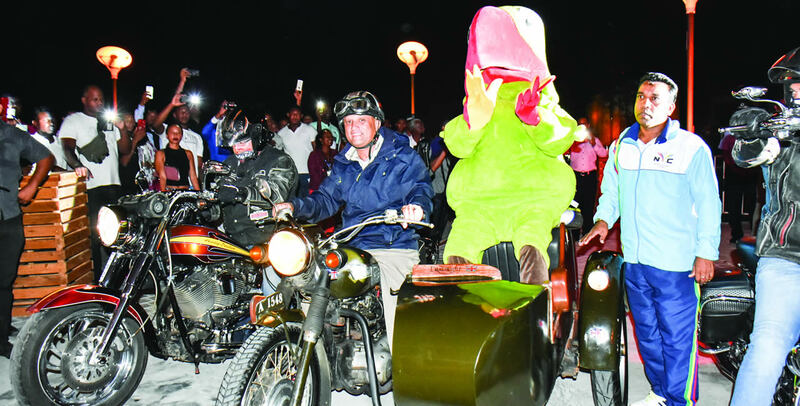 After the helicopter, the speed boat and the cart, during the last three mobilizations, the mascot of the Games arrived in Harley Davidson-sidecar on the occasion of the countdown. The Frenchman Anthony Gillet and the Dutchman Alex Swamipersad mesmerised the audience with a show in the water on their flyboards. The show ended at around 9.00 p.m. with a breathtaking firework.